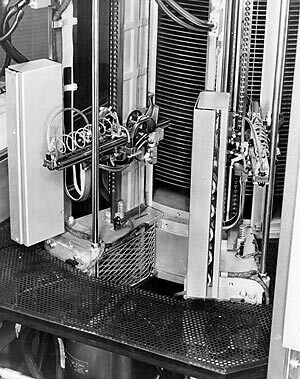 Big Data in 1956: IBM Launches the Disk Drive Industry | What's The Big Data? Today you can buy a 1 terabyte Seagate 3.5-inch disk drive, the size and weight of a small book, for $85 from Amazon. The 305 RAMAC created an industry that is estimated at $32.6 billion in 2013, according to iSupply. But this is down from $36.7 billion last year, as solid state drives (flash memory) used in mobile devices are growing fast at the expense of hard disk drives. Indeed, a leading disk manufacturer, Western Digital, just acquired flash storage supplier Virident. This entry was posted in Big Data Analytics, Big Data History. Bookmark the permalink.